As we always say in the shop, you are keeping water not fish; this is why it is important to test your water regularly for any irregularities in your water quality. 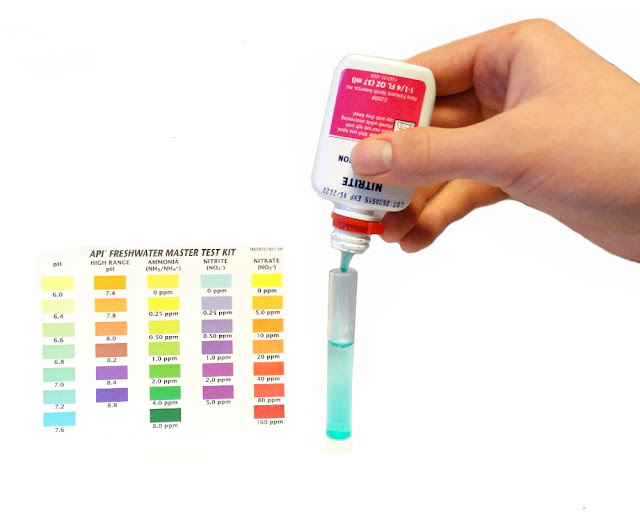 We suggest testing your water weekly predominantly for nitrite and nitrate. Others tests, such as PH and ammonia, can be tested weekly but they can be done every other week too. Problems can quickly spiral out of control in an aquarium. Regular testing of your water ensures that you can find out what’s wrong quickly so you can act upon it sooner. When it comes to test kits we suggest you use the API range of test kits, but others you already have are suitable too. API do a simple dip strip test where you dip a strip of card into your water and read the result; these test for all elements in one go. API also do drip test kits which give you far more accurate results where you can test for individual water quality elements. We prefer using these just because of the accuracy you get and you can keep a record of you results easily to monitor trends you may have with water quality. What to look for in your results? Nitrate – Your nitrate should be from anything between 0 and 20 PPM. You are always going to have some nitrate in the water but it must be kept at a minimum. Nitrite – Your nitrite level should be on 0 PPM. Nitrite should be very low as it is much more harmful to fish than nitrate. Ammonia – Ammonia should be at 0 PPM. There can be a slight amount such as 0.25 PPM but it should not be any more. Ammonia burns are one of the biggest killers for fish and it causes them a great amount of stress and pain if there is too much in your water.